On October 9th of last year, I happened across this beauty in the breezeway of my apartment in Columbus, OH. The specimen was dead, but exceedingly fresh. It had been a chilly night, with a low near 40; she had evidently perished just a few hours beforehand. Not being a lepidopterist, I really had little idea of what I had found, other than that it was an erebid moth not unlike the Black Witch (Ascalapha odorata). However, further investigation demonstrated that this enormous specimen (wingspan 15 cm., as shown) was in fact a female Owl Moth (Thysania zenobia), along with the Black Witch a member of the Thermesiini. Much to my pleasure, the find is unusual. T. zenobia ranges throughout the eastern Americas south to Rio Grande do Sul (Specht et al., 2004), and occurs in the Greater Antilles and Galapagos Islands (Roque, 1999): according to the Ohio Lepidopterists' Society, it has only been collected in the state on five occasions, none of which occurred in Franklin County (Rings et al., 1992). Indeed, the animal is a tropical stray. Their caterpillars' cassiine host plants (Specht et al., 2004) do not grow natively in the Lower 48. Early authors even proposed that its appearance in the northern United States was due to human mediation (Felt, 1907). However, given that they have cropped up in good condition in Wisconsin (Ziemer, 1949), New England (Farquhar, 1938) and Ohio (Rings et al., 1992) on occasion, it is now clear that the moths fly northwards under their own power; their native presence in the Galapagos would also indicate excellent dispersal capabilities. Farquhar, D. W. (1938). The Lepidoptera of New England (Doctoral dissertation). Harvard University, Cambridge. Felt, E. P. (1906). 22nd Report of the State Entomologist on injurious and other insects of the state of New York 1906. New York State Museum Bulletin, 110, 39-44. Kilman, A. H. (1889). Correspondence: a rare moth. The Canadian Entomologist, 21(1): 240. Rings, R. W.; Metzler, E. H.; Arnold, F. J.; and Harris, D. H. (1992). The Owlet Moths of Ohio: Order Lepidoptera, Family Noctuidae. Bulletin of the Ohio Biological Survey, 9(2), vi+219 pp. Roque, L. (1999). 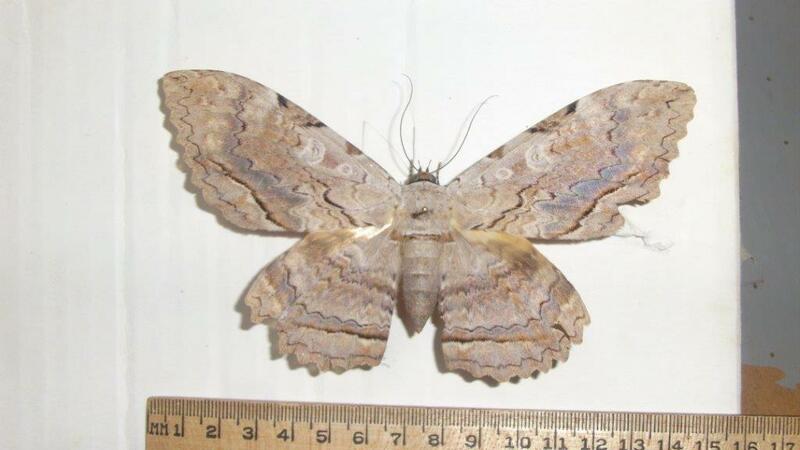 Two large tropical moths, Thysania zenobia (Noctuidae) and Cocytius antaeus (Sphingidae) colonize the Galapagos Islands. Journal of the Lepidopterists' Society 53(3), 129-130. Specht, A.; Silva, E. J. E.; and Link, D. (2004). Noctuídeos (Lepidoptera, Noctuidae) do Museu Entomológico Ceslau Biezanko, Faculdade de Agronomia Eliseu Maciel, Universidade Federal de Pelotas, RS. Revista Brasileira de Agrociência, 10(4), 389-409. Ziemer, S. E. (1948). Erebus odora and Thysania zenobia in Wisconsin. The Lepidopterist's News, 2(3), 25-36.